Another project knocked off my to do list. Last week I finally started working on it, a little bit here and there. The part that took the longest was actually marking out all the measurements for stitching. I used a white colour pencil for this, all my other fabric markers didn't show up on the heat resistant fabric. Over the weekend just gone, I finished the machine sewing and then was able to work on the binding and buttons in the evenings. I haven't included a photo of the caddy unfolded, it was very hard to photograph silvery fabric and get a decent photo. My "must makes" for other people are done, so now I can get back to my never ending wip list. 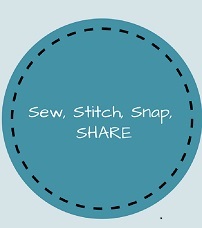 Now, it's YOUR turn to share, by linking up your sewing and stitching projects, whether they are starts, wips, or finishes, following these guidelines. The past week has felt like spring is on her way. We have had beautifully fine if somewhat cooler days. Yesterday I repotted some pot plants, weeded the vegetable garden in anticipation of the compost I 'll be digging in soon, and had two loads of washing blowing in the breezey sunshine on the clothes line. Here's a rundown of the pretty parts of my weekend though. Black Velvet Cake - recipe from this beautiful book and also found here. This smelled divine as the stout, butter, chocolate and cocoa gently heated and melded together. The cake itself was delicious, very rich, so pieces smaller than what are cut are in order. The Chosen Few by Gregg Zoraya. This is a true story about a platoon fighting in Afghanistan, it read like fiction, I couldn't put it down. Such a heartbreaking read though, and such courageous young men. Hoping you have all had a fabulous weekend too. See you next week. Miniature cyclamen still flowering in my garden, they are nice and sheltered, so flower from early autumn on. Meat free Monday is definitely happening in my home and without to much grumbling from the family either. This week it was Moroccan Red Lentil and Chick Pea burgers - recipe from here. Also I have decided to stop my Cook the Books posts, I'll still link to recipes and show photos of some of my baking or more interesting meals, just not in a separate post. More ice cream soda blocks - little bits get done during lunch breaks, or while waiting in the car during Miss B's archery sessions. My current reading pile - lots of different genres and themes, some for the book club I am co-hosting at work, so I really need to crack into them. Most of my weekends seem to be an endless repeat of cook, sew, clean, so here's what I have been sewing and cooking this weekend. I am really something of a quilting butterfly, I flit from one sewing/quilting project to the next. I guess there is no chance of getting bored with any of them, or finishing any of them quickly at this rate. Anyhoo, I have flitted back to the Wide Open pouch I was making for my sister. After a concentrated sewing effort, I got the side panels completed and sewn in , (Gosh wonder clips are a wonderful investment and product for this type of project), the bias binding made and attached, then detached and re-attached. Those curves were hard with layers of soft and stable and fabric. After finally getting the binding attached successfully, I decided to hand sew the binding down rather than top stitching it on my machine. Now it's just the zipper, and the final pieces of binding to be sewn on. Wishing you all a fabulous week, hopefully, I'll have a completed pouch to show on Sew, Stitch, Snap, SHARE.this Wednesday. Feeling // inspired by this blog post a friend sent me to read, and thinking I might try it for some of my EPP blocks. Making // a longer arrow block for Miss B's quilt (a little wonky I know, and goodness knows how since it was paper pieced, but I'm going to try and embrace the imperfections, and I really can't be bothered unpicking it all). Another Ice cream soda block, this time with a repurposed vintage embroidered tray cloth and Liberty, check out those tiny bullion knots that make the flowers. Dreaming // of summer fruits (my sister is gloating about how cheap strawberries are in Brisbane at present). Two more Ice Cream Soda blocks completed, so that's the first two months finished. I love how they look together, and am now wondering about incorporating some vintage embroidered linens into the next months blocks. Some more filler blocks for Miss B's sea glass beach sampler quilt. A pile of fictitious goodness - now I just need some mornings to lie in and read. The poppies I planted a couple of months ago are flowering, unfortunately I think my sweet pea seeds have rotted away. Hope you have all had a fabulous weekend too. With the colder winter nights we have been having, Miss B pulled out my scrappy sampler quilt to use on her bed. I have had it rolled up in a basket since I finished it, and had forgotten how much I loved it, and how much I love seeing it being used. This encouraged me to pull out the blocks I had made for her sea glass sampler quilt, and start piecing some of them together and making low volume improv filler blocks for it. I don't think this quilt will be as large as the one she has been using, it will probably be more of a lap quilt size, but she can put it over her legs when she is studying at her desk in her room. She has asked that I add some more feather and arrow blocks to the assortment already made, so I may add a little more purple to some of those. I suspect I may create a few more new blocks too, so no doubt my planned lap quilt will end up being bigger than anticipated. Colour inspiration for this quilt can be found here.